Small Pleasures was preceded by a number of studies and related works, the earliest of which, With Sun (oil and tempera? on glass) appears to date from about 1910. The composition of Small Pleasures is centered round two hills, each crowned by a citadel. On the right-hand side is a boat with three oars which is riding a storm under a forbidding black cloud. To the bottom left it is possible to make out a couple at a steep angle to the hill, and above them three horsemen arrested in full gallop. A fiery sun flashes out wheels of color. The actual interpretation of these elements has been the subject of much controversy; especially since the recent discovery of an unpublished essay on the painting written by Kandinsky in June 1913. This document appears to discourage the irony which some have read into an imagined discrepancy between the title and the actual work, and reduces the heavy apocalyptic signification of the imagery. 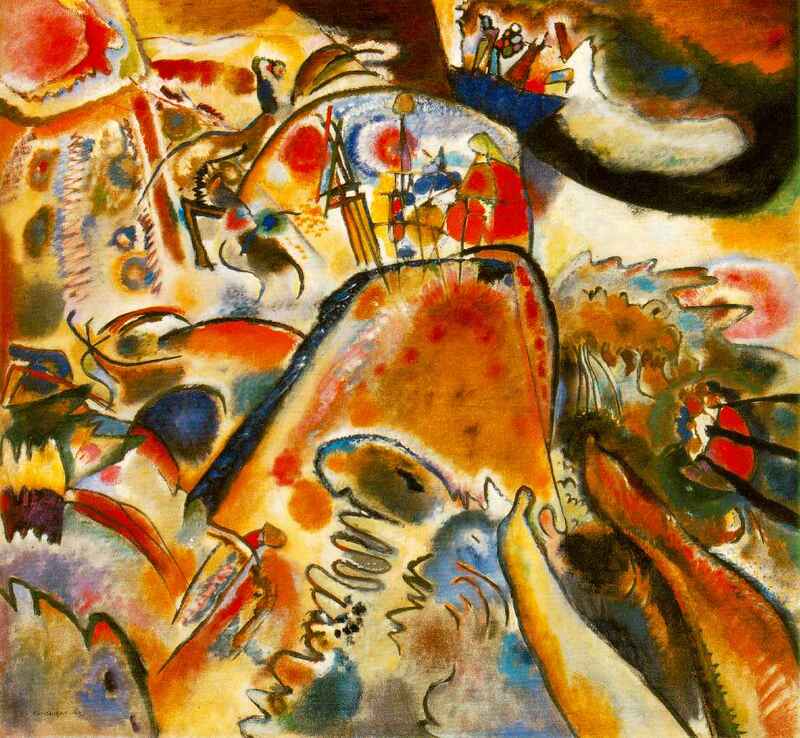 Indeed Kandinsky writes of the 'joyfulness' of execution. It is legitimate then, to see the work as a celebration of Kandinsky's style during this period, as affirming the spiritual and practical pleasures he manifestly derived from painting; he speaks of 'pouring a lot of small pleasures on to the canvas'. While giving the impression of heavenly chaos, Small Pleasures is obviously not the product of pure spontaneity. The various modes of paint application, and the complexity of pigment selection and mixing are enormous. The way colors are washed and blurred together, and seldom contained by bounding lines is typical of Kandinsky's work at this time. The predominantly curvilinear aspect of the work, however, is undermined by the angular geometry of the citadel, perhaps presaging Kandinsky's Bauhaus style. There are few monochrome patches in the composition, underlining the local scale of execution, and part of Kandinsky's pleasure in the work was his reflection on a number of minor technical achievements. He wrote of the 'fine, very fine lines' scrupulously worked in with an extra-thin brush, and of his successful suppression of 'lustre' from the gold and silver areas.